She was being honored as Woman of the Year at Billboard’s annual Women in Music event. Madonna was unequivocally #WithHer during the recent presidential election, which might explain why she had politics on her mind on the red carpet Friday at Billboard’s Women in Music event, where she is being honored as Woman of the Year. 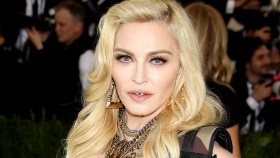 Madonna loves her ex-husband Sean Penn, something she has said twice to his face this year. The actor appeared onstage at the pop star’s Raising Malawi charity auction and gala during Art Basel in Miami Friday. He craweled in between her legs and slapped handcuffs on her playfully. She told the audience she would marry him again if he bid $150,000 for a necklace. He did, but was later outbid. Madonna covered Britney Spears’ “Toxic,” taunted Donald Trump, twerked with Ariana Grande and reunited with ex-husband Sean Penn during an event Friday at Miami’s Art Basel that raised $7.5 million for the singer’s Raising Malawi charity. Billed as a “Night of Art, Mischief & Music,” the Tears of a Clown event, which streamed live on Facebook, featured a unique Madonna performance as well as an auction of personal items to help raise funds for Malawi’s first Pediatric Surgery & Intensive Care Unit. Among the items receiving the biggest bids were three Herb Ritts-shot photos from Madonna and Penn’s 1985 wedding, which drew a top bid of $230,000. Other items included a costume from a Madonna tour (modeled Friday night by Grande) and artwork from Madonna’s personal collection, including a print by artist Tracey Emin that sold for $550,000.